The other night while I was taking a bath I had a really big idea. I suppose this is because I had just poured the last of a bottle of essential oil into the bathtub. 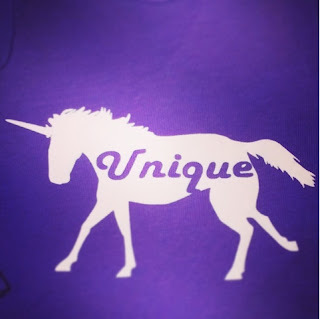 Most of you know, besides my online shops, I also use and sell Young Living essential oils. In the two years I've been using oils I have replaced most of the toiletries, cleaning supplies, and supplements I used in the past with essential oils. 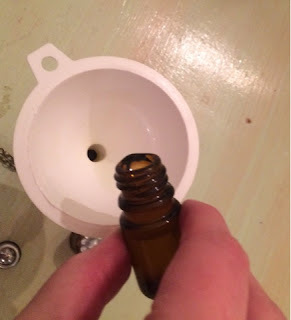 One result of this is we have quite a lot of essential oil bottles around the house. I clean them out and re-use them to make my own custom blends and roll-ons, but I still have a lot left. 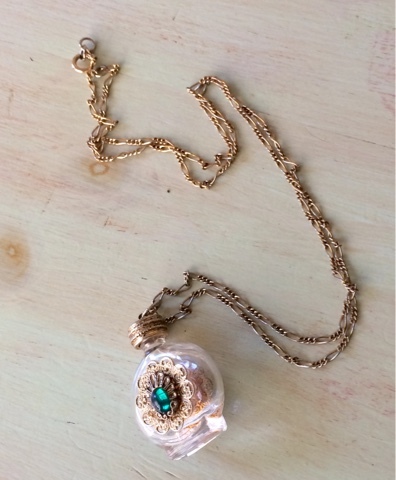 Back when I was in high school I bought a necklace I thought was cool, a decorated glass bottle pendant. The bottle is a real bottle but it doesn't open so you can't fill it with anything. I still wear the necklace today. It's in great shape even though now it's considered a vintage piece, and my kids all absolutely love it. With the advent of the Harry Potter stories the children started calling it my "Magic Potion" necklace and they always want me to open it. It does look like something one of the witches and wizards from the story would use. 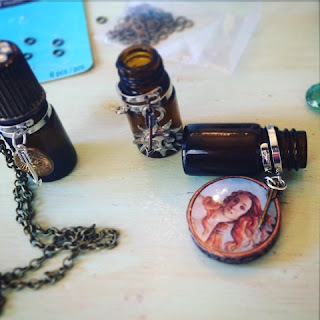 I decided to see if I could make a necklace that could store a real "potion". I use vintage charms and beads. I have a huge stash of vintage charms and beads, as well as various jewelry findings, in my office and I found more than enough to decorate the bottles. 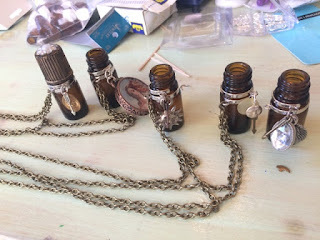 I made the necklaces from brass chain and double loop bezels that happen to be the exact size necessary for the bottles. I add a roller ball. 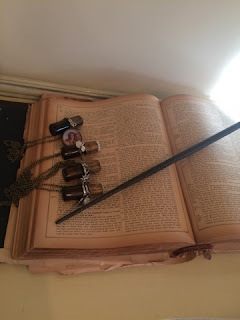 For my potions, I decided to start with two inspired by the Liquid Luck and Essence of Dittany in the Harry Potter stories. I call mine Lucky Liquid and Elixir of Dittany. I was just going to put a cap or cork on the bottles but I worried a child might try to drink the liquid. Neither of these blends have oils that can't be ingested (most essential oils cannot be ingested but due to Young Living's promise of purity and careful distillation process most of theirs can) but drinking such a large amount of even safe for consumption oils could be harmful to a child or even an adult since oils are so concentrated. I decided to put a roller ball on the bottle so the oil blend is a roll-on perfume and a child wouldn't be able to drink it. 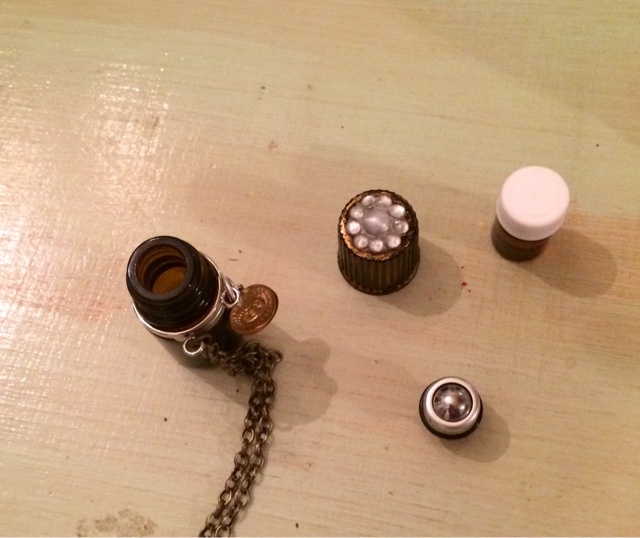 The kits include a roller necklace and oils. 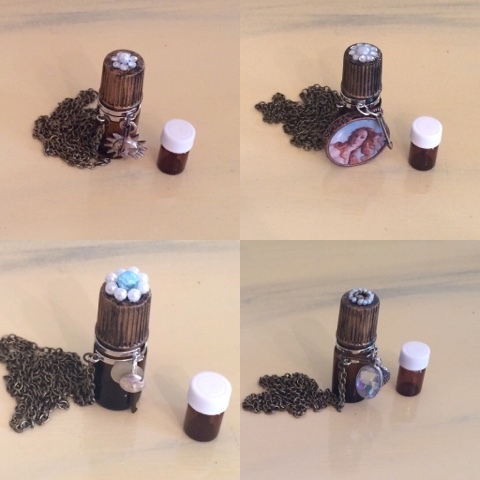 Each kit includes a handmade necklace, a roller ball and cap, a 2ml bottle of essential oils, and a 5ml bottle of coconut or grapeseed carrier oil. I decided to make the set a kit so if the buyer wanted to make a different scent than the two I am currently offering they could do so. The Lucky Liquid oil blend includes motivating and inspiring oils such as Balsam, Orange Peel, and Coriander. Its scent is citrusy, spicy, and woodsy. The Elixir of Dittany blend doesn't actually have any dittany. Dittany is a rare and endangered plant that grows only on the Isle of Crete in Greece. I was inspired by the Essence of Dittany's cure-all properties in the stories to make a soothing oil blend. This blend features lavender, manuka, and frankincense, all oils good for minor skin irritations like cuts or scrapes. The scent is floral with notes of honey and wood resin. Prepare to assemble the roll-on. I think it would be a really fun activity to assemble your roll-on with your kids. I definitely recommend adult help, however, so you don't end up with oil all over the place! 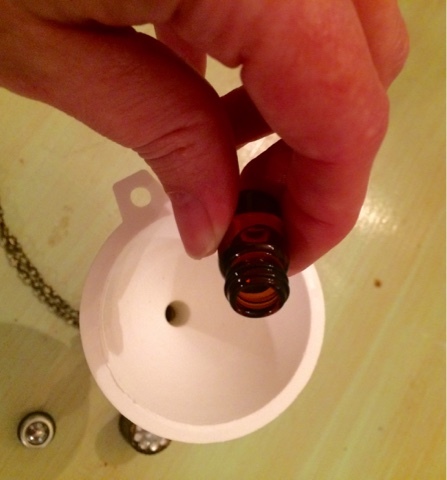 You will need a small funnel or eye dropper and a dish towel or paper towel, the only items not included in your kit. 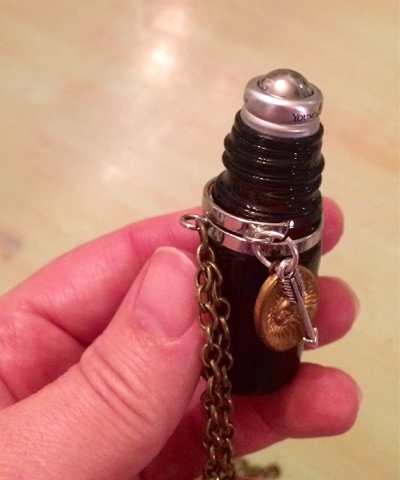 To begin, empty the contents of the tiny bottle to the necklace. These are the essential oils. Next add the carrier oil to the necklace. This is the larger bottle. 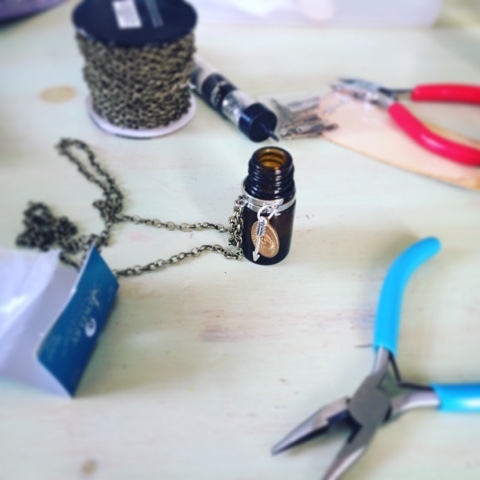 There will be a little extra carrier oil, so be careful not to overfill the necklace. Add the roller to the necklace. Full disclosure: I ALWAYS overfill the bottle! 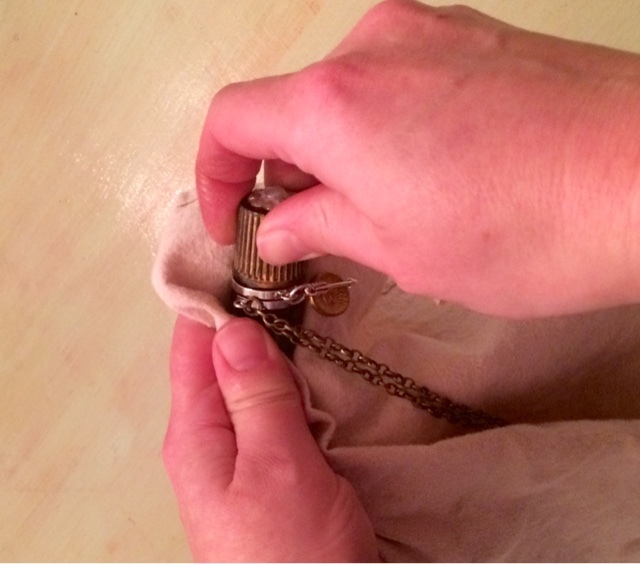 I have learned to pour the carrier oil in over the sink and I usually wrap a towel around the bottle too. 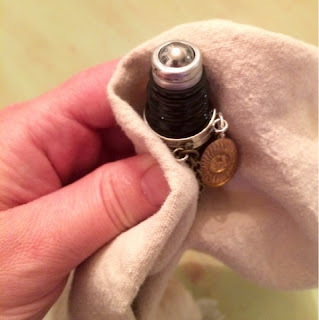 You will definitely need to wrap the bottle in the towel to place the roller because you need to get a tight grip on the bottle. Tighten the cap to insert the roller. To insert the roller, it is necessary to use the cap. Screw the cap onto the bottle and tighten it as hard as you can. Be careful not to break the bottle! This is another reason for holding the bottle with the towel. Occasionally I have to use the towel to press the roller ball down and then tighten the cap on it again to get it to go all the way in. Make sure the roller ball is all the way in. Confirm the roller ball is inserted all the way. There should be no gap between the metal band under the roller ball and the lip of the bottle. Once the roller is inserted all the way it's secure and not too easy to remove. If you got oil on your necklace, which I always do, you can wipe it off with a paper towel saturated with window cleaner or alcohol. 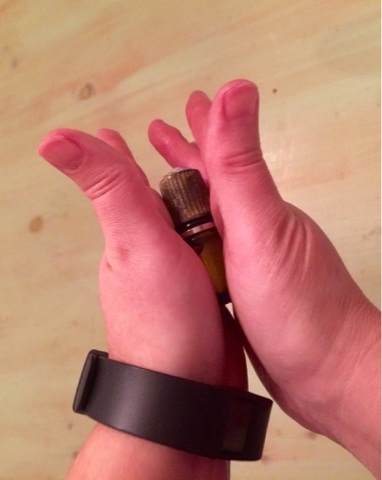 When you have the roller in place cap the bottle and roll it in between your palms. The heat from your hands helps the oils to blend together. Turn the bottle upside down and right side up a couple times. You are ready to apply your oil! 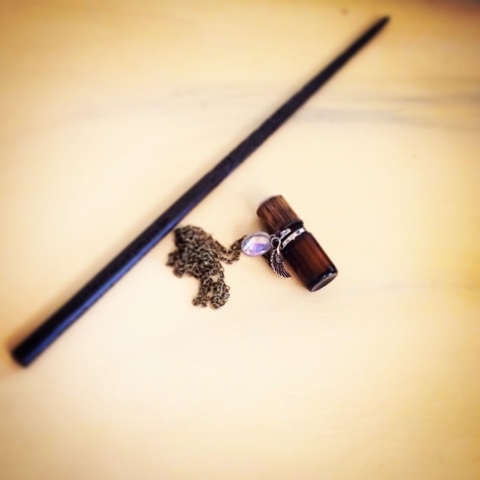 Use as you would perfume, applying to the pulse points on your wrists and neck. In the case of the Dittany you can also apply it to any sore cuts or anything like that. Then grab your wand and go! The chain is 16 inches long on average. 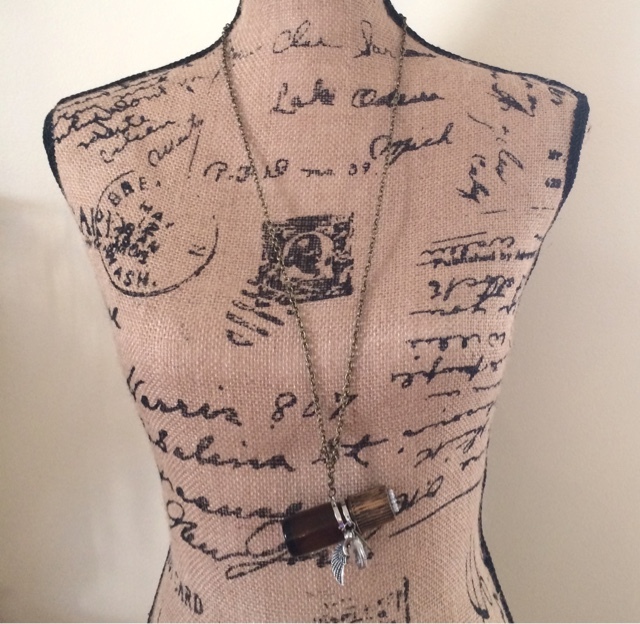 I am pleased with the trendy steampunk style of these charm necklaces! Each necklace is completely unique since I use so many vintage materials and they are all handmade. 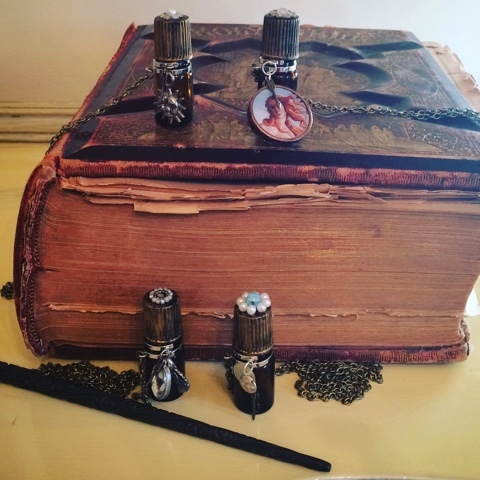 I think you will get a lot of compliments and find your necklace a real conversation piece. The essential oil blends are well-diluted, and you could dilute them even more by adding only half the tiny bottle if you want to lessen the scent or make your oils last longer. 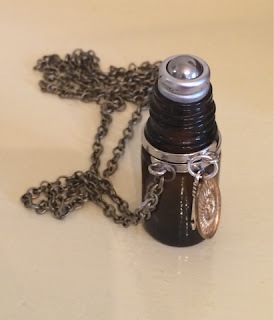 The diluted blends should be safe for children to apply, but only allow children age five and up to play with the necklace since the small charms could be a choking hazard. Even then use your best judgment of the child in question to make sure they can safely play with a glass bottle. You can buy your Magic Potion Kit from my Etsy shop and you can also just purchase a necklace to fill yourself. Through March 15th you can get a FREE Potion kit when you purchase a Young Living Premium Starter Kit from me. Order those using this link or from www.youngliving.com and use Sponsor Number 2256091 to make sure you're ordering from me. One of the most rewarding things about my job is meeting people literally from all over the world, who I would never meet otherwise. 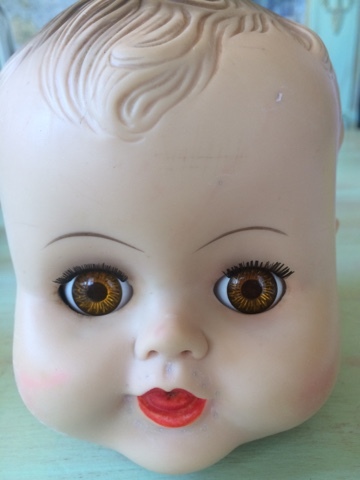 Yesterday I spent a good chunk of the morning "talking" via email with a lady in India about how to clean her doll and then I got to work on a doll's head which arrived in the mail from South Dakota. I'm not sure exactly who this baby is; she's marked I.C. on the back of her neck. 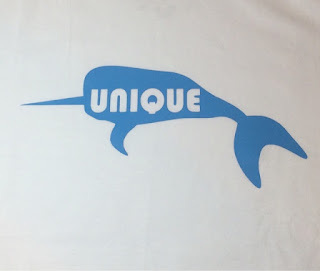 That mark was used by Italocremona, an Italian company, and also sometimes by IMPCO and Eegee here in the USA. 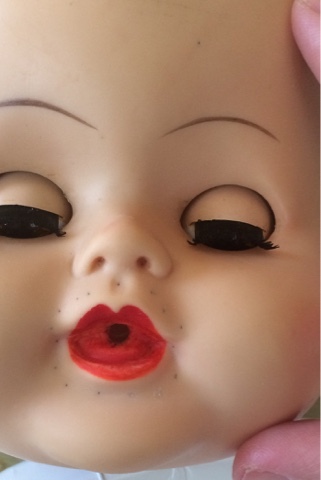 I'm pretty certain she's not an Italocremona doll because those had very distinctive faces. This doll looks like she used the Madame Alexander Kathy baby molds or very similar molds, so I assume she is what is know as a "grocery store" doll: a less expensive copy of a high end doll. Many grocery store dolls used the exact same molds as the dolls they were copying and were just made with somewhat less expensive materials. 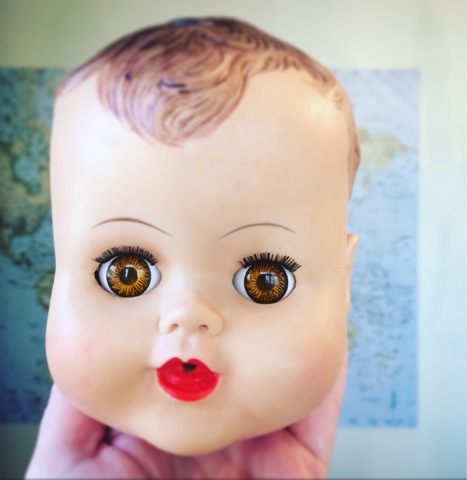 Regardless of whether she was a high-end doll, this baby was and is a much-loved doll and that showed. She had a lot of damage. 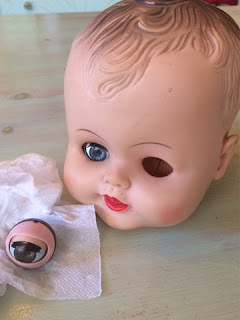 Her eyes were broken and someone scraped up the eye socket around the broken eye, trying to get it to open and close again I assume. Her little stylist pierced her ears and, not content with that, went on to give her a sort of tribal tattoo around her lips and here and there on her head. 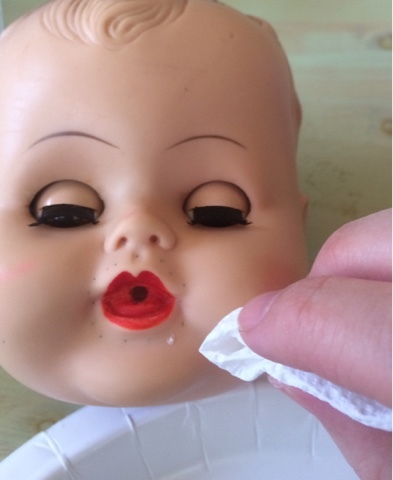 Begin by cleaning the doll. 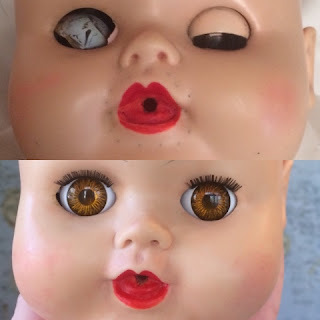 I began my restoration by cleaning the doll. 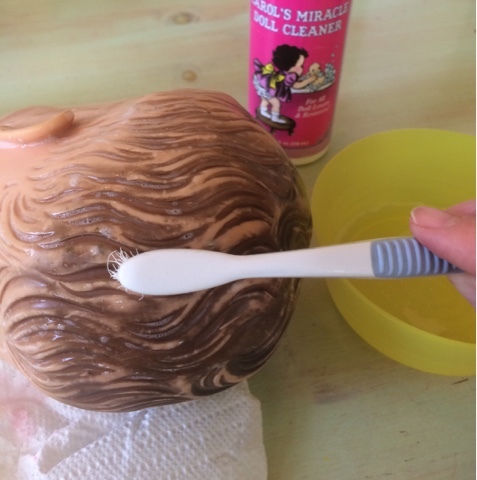 I use Mr. Clean Erasers and various brands of doll cleaners, such as Carol's Miracle. After I got her as clean as I could I sized her eyes. The original eye compared to a new eye. 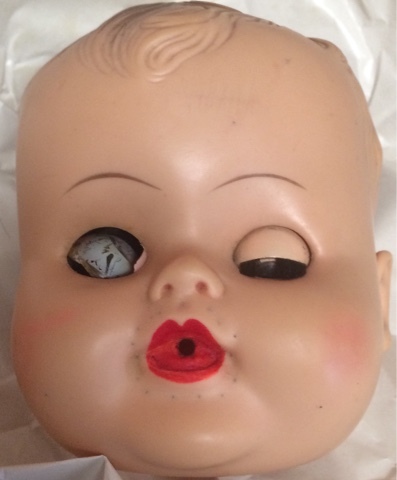 This doll can take either a 17 mm eye or a 20 mm, possibly as large as a 22 mm if you could find a pair. The doll's owner originally wanted blue eyes, so I was really hoping to use a 17 mm because my supplier is out of the 20 mm in blue. Unfortunately, the eye with some gouges out of the socket just looked too large for the 17 mm and the 20 mm is just perfect. 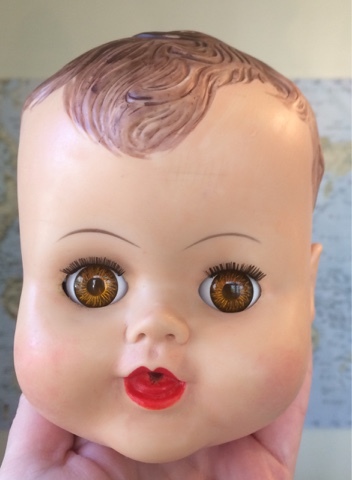 Luckily, since doll's eyes were originally a hazel green, the owner decided she preferred brown after all. Baby does look sweet with her big brown eyes! I went on to tackle the mouth tattoo and the various stains and scratches I was unable to clean away. To begin I used acrylic super heavy modeling gel to fill in the holes rather like spackle. You could also use acrylic modeling paste, which isn't quite as thick. I used the heavy gel to glue the new eyes into place as well. 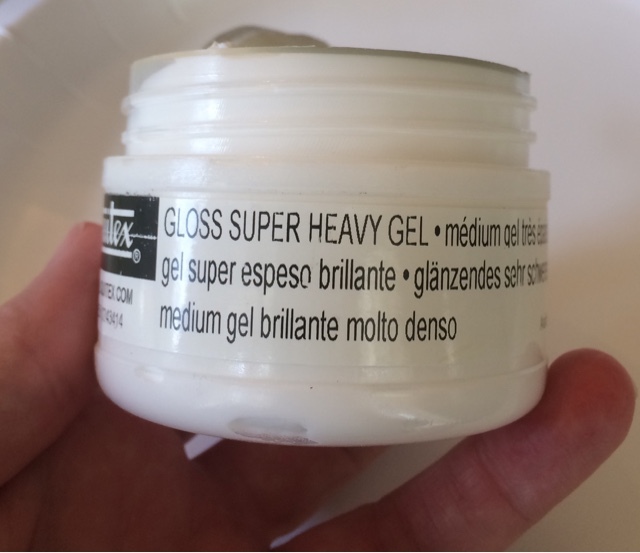 Fill the holes with super heavy gel. Tint the get with acrylic paint. 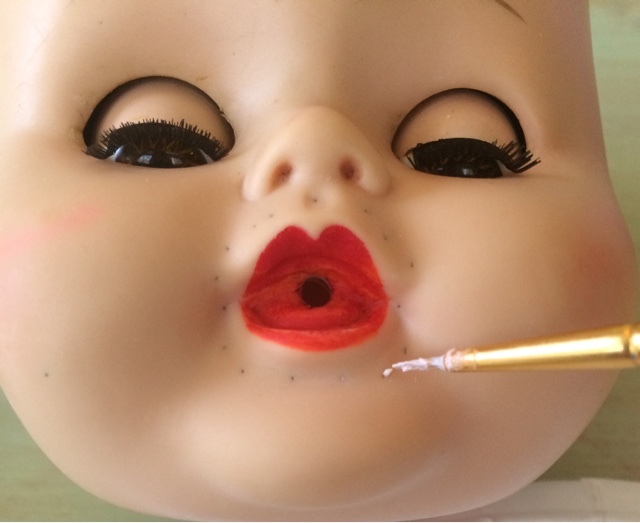 To begin, tint the heavy get with acrylic paint in the doll's skin tone. 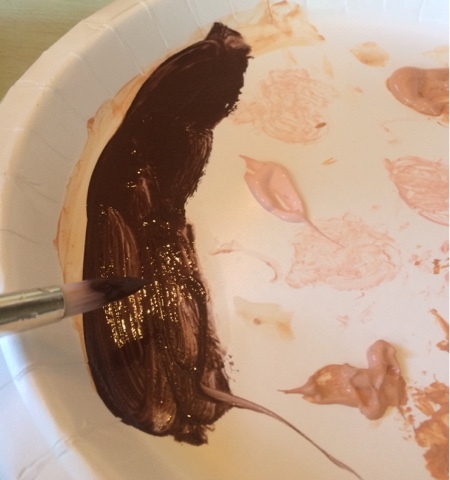 The heavy gel dries extremely quickly, so just mix up a tiny amount at a time. Brush the tinted gel over a hole. Working on one or two holes at a time, brush a little tinted gel over the hole. Wipe away the excess gel. Then wipe the excess gel away with a paper towel. 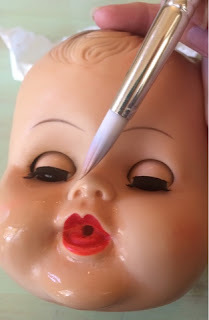 This works the gel into the hole and removes it from the doll's skin. 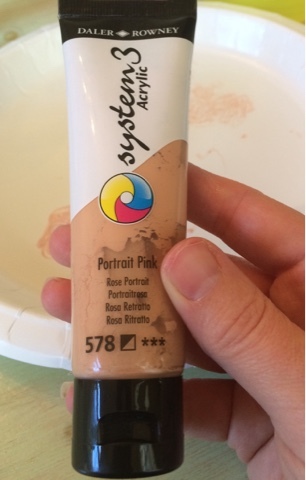 It is pretty much the exact same process as you use to repair crazed composition, except with acrylic paint. A couple holes after being filled. As you can see, filling the holes makes a big difference immediately, but since they're still visible I went on to paint them. Before painting, I had some deeper holes to fill. Deep hole after several fillings. Deep holes like the one in the baby's temple will require more than one filling. Brush your gel on and wipe it away. Let it dry and repeat with another layer of gel. The layers dry quickly. Keep layering gel until the entire hole is filled. Paint over the filled holes. 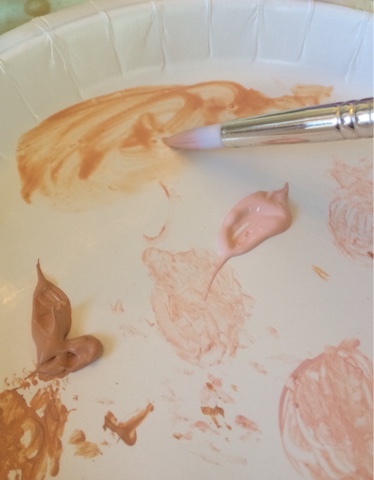 After the gel has dried, paint over the filled holes using acrylic paint. This may be sufficient if you don't have widespread discoloration on the doll. Thin the paint with water. Brush the watercolor all over the surface. 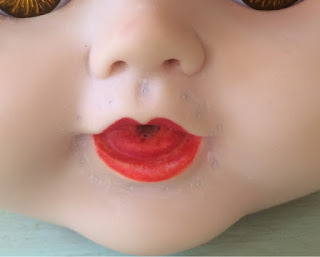 If your doll has lots of stains and scratches like this one, or if the painted repairs are still somewhat visible, you can apply a wash of watercolor. Thin the acrylic paint you've been using with water until it flows easily. 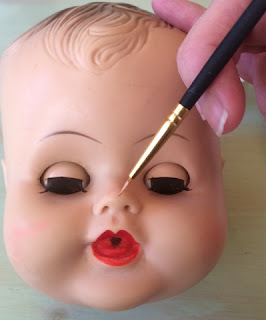 Flood the surface of the doll using a watercolor brush, being careful to avoid getting paint in the eyes. Dab any drips with a paper towel before they dry. Work in one small area at a time, as the paint will dry quickly. Allow the paint to dry. 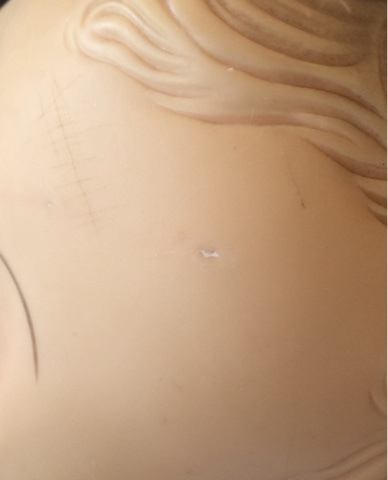 Since I already had paint out I decided to go ahead and paint over the doll's molded hair, which had a lot of paint loss. I used the same watercolor technique on the hair as I used on the face. Once my client signed off on the doll I sealed the paint job with a thin coat of acrylic matte varnish. Now Baby should be ready for another 50 or 60 years of play! This doll is a patient and belongs to her owner, but I have many similar dolls in my shops on Etsy, eBay, and Facebook, so I hope you'll check. For many years now I have wanted to design my own fashions, particularly for kids. I'm serious when I say "many" years; I have been thinking about this ever since I used to play with my Barbie Dream Store, a favorite childhood toy. I did and sometimes still literally dream about owning my own store! 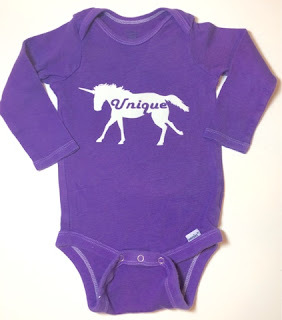 Of course, over several years I've built up a brand of sorts on eBay and Etsy, and I do sell kids' clothes and toys and dolls, but these are mostly curated rather than created by me. Now I am so excited to finally be creating my own pieces! For Christmas I got a Silhouette Cameo machine from my husband. It's taken me a while to get the hang of it. I'm getting fairly good at designing for heat transfer material but have yet to even attempt the etching, stamp-making, or sketching functions. 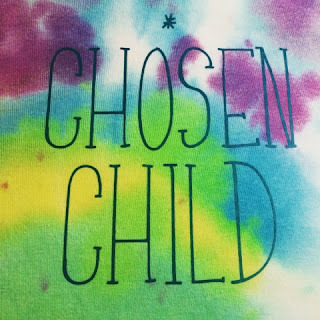 I have started making shirts and bodysuits and I'm really thrilled with the designs I've made so far. My first design was this Chosen Child shirt for my son and other adoptees. I am focusing primarily on uplifting shirts to celebrate adopted and special needs kids. Next, I created a unicorn decal that says "Unique" inside the body. Back in the late 1970s or early 80s I had a sweatshirt with a stuffed puffy unicorn appliqued on the front. Behind the unicorn a rainbow shot across the shirt with the word "Unique" inside it. That shirt was my absolute favorite and I can still see it in my mind. 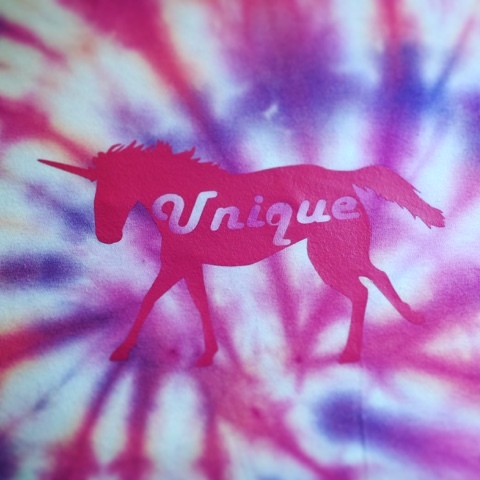 It was definitely the inspiration, for this design, although I don't have the skills to make crazy rainbows and stuff on my machine yet! I made the first unicorn shirt for my daughter and then made a couple bodysuits to try out decals cut from flocked and glitter transfer material. The flocked material gave me serious trouble at first but I finally got it figured out and have now confirmed the special materials wash well. 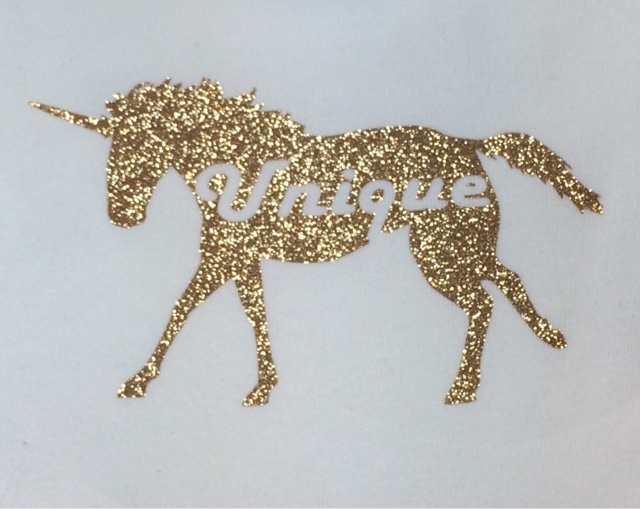 I was worried the glitter or flocking might flake off but it doesn't. 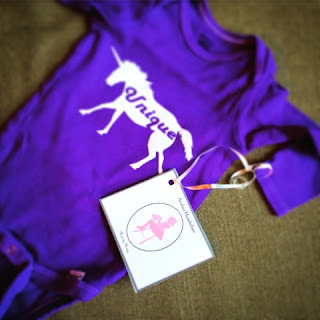 I have these test shirts listed on eBay and Poshmark and have them available by order on Etsy and Facebook. 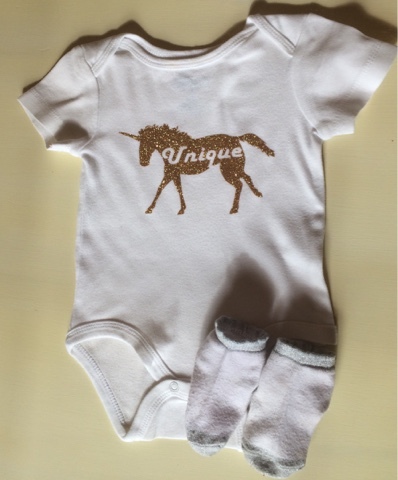 About the time I was making my unicorn shirts my youngest son was having some trouble dealing with his physical differences. 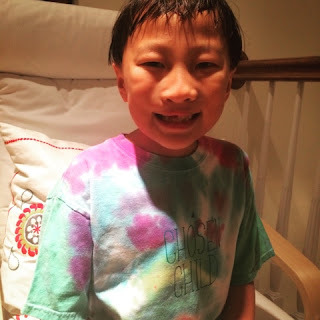 He was born with a cleft lip and palette and besides the often painful medical procedures and effects, like frequent ear infections, of this deformity, his appearance occasionally bothers him. I think his repair surgery was extremely successful and that he's adorable, but as he has grown he's developed an underbite and some unevenness to his nostrils. This is due to the fact that the missing bone in his mouth where his cleft was open isn't growing like the rest of his skull. This will be fixed; his next surgery will most likely be later this year, but in the meantime it gets him down. 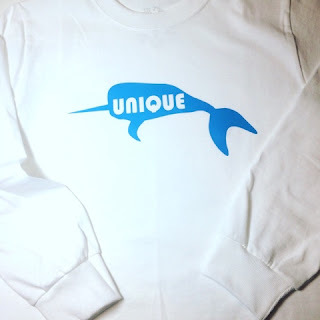 I decided to make a more masculine "Unique" design for him. I chose a narwhal and explained to my son that, just like a narwhal is unique among whales, he is unique among children. 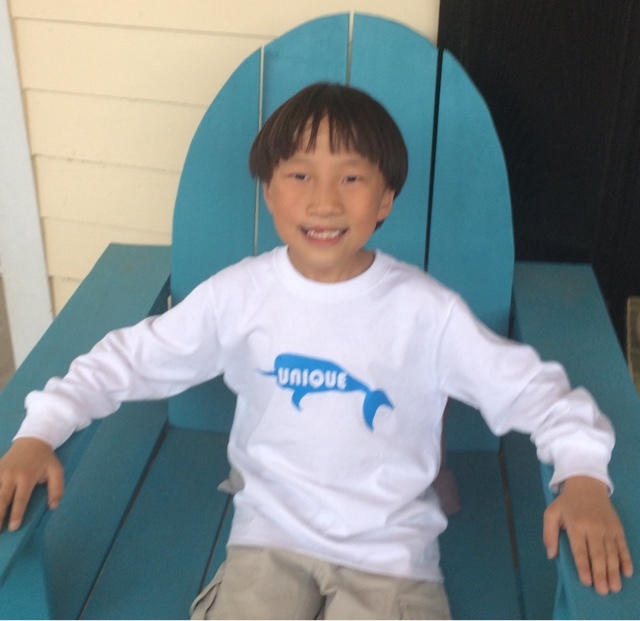 He is thrilled with the design and it must be cooler than I thought, because my daughter requested one as well! 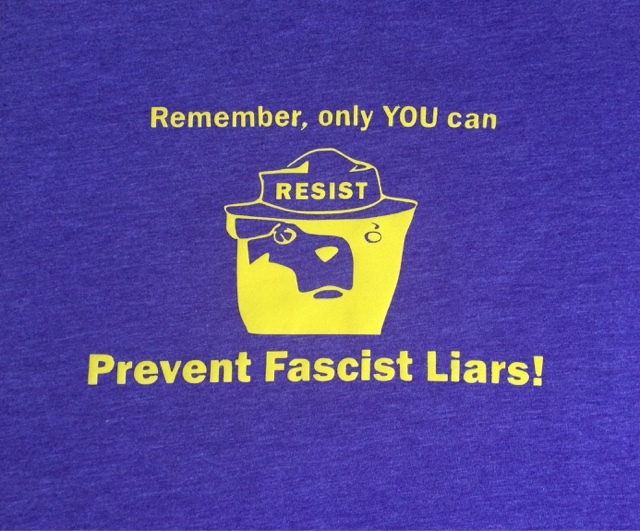 In a complete departure my oldest son, not to be left out, requested his own shirt: a political environmental activist shirt featuring Smokey the Bear as a resistance symbol. 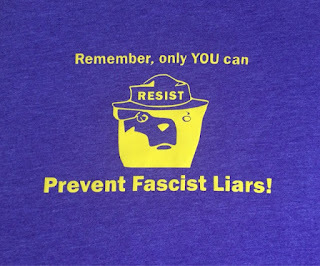 I studied vintage Smokey the Bear posters to style the image and typography. 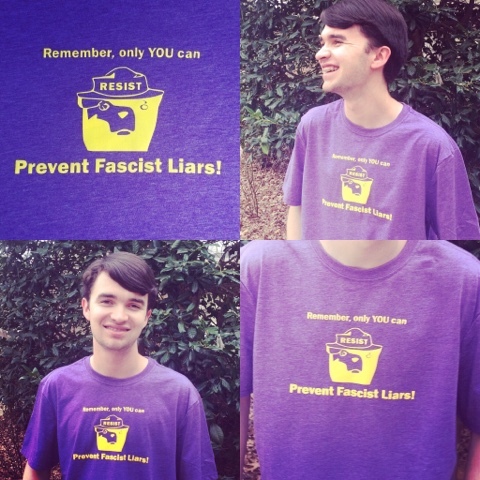 Then I cut it from yellow flocked vinyl and ironed it on a purple shirt because purple and yellow are his university's colors. 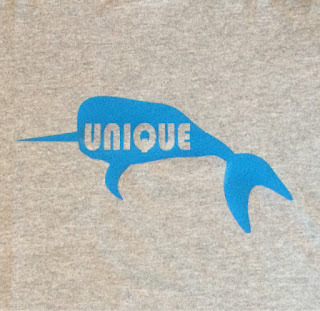 This design has been pretty popular on my social media feeds, so I'm offering it for sale. It's been one of my most ambitious projects to date and I messed up a bunch of expensive flocked vinyl before I got it to cut correctly but now that I've worked out the kinks it should be smooth sailing. It's really hard to even describe how great I feel about being able to sell my own brand of clothing! I have plans to start sewing some outfits and then applying my designs to them and even have ideas about making stencils to print my own fabrics. My ultimate goal is to have as much as possible made entirely by me, here in the USA! 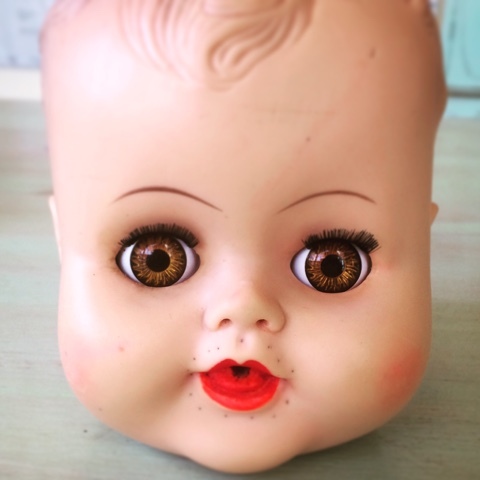 Of course, I have wanted to make my own dolls for many years now as well. Maybe one of these days I will actually be able to hire some employees and make my big dreams come true, but these shirts are a step in the right direction. Please visit my eBay and Poshmark shops to buy ready-made fashions or order custom designs from my Etsy and Facebook shops. 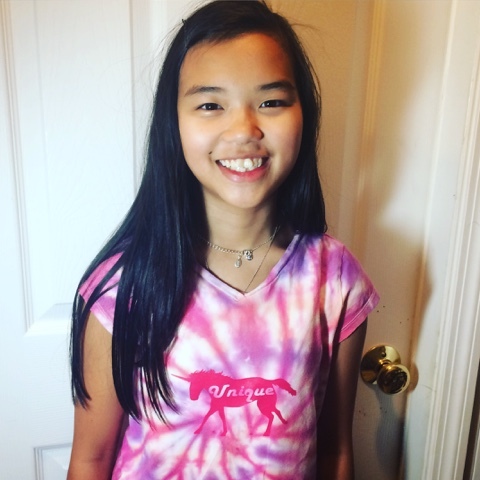 I can print the solid color shirts in a day or two, but the tie-dyed shirts take a week or so due them having to dry before I can print them.